Java coffee served, Israeli dark chocolate on hand. As a young child I was made painfully award that the world hates us. Pure and simple, just the facts. No explanations, no reason why, no need to understand; Just know it! The world hates us. As the years would roll on I would devote myself to trying to understand why. Countless books and discussions would follow. Growing up seeing neighbors with numbers tattooed on their arms by the Nazis was a constant reminder that just a few short years earlier there was a concerted international effort to wipe our people off the face of the earth. This was of course only a continuation of an effort that began about 2,000 years ago. We grew up with history lessons; real personal history. My classmates from Yemen, Germany, Poland, Russia, Iraq...all had family stories filled with hate and persecution. I recall being moved by Itamar's story of how his father, as a young child, jumped off the train headed to Auschwitz and ran to the forest. I recall thinking that had his father not jumped my friend would not be here today in class. If this were not enough there were other reminders. As a child I recall seeing the warnings..."Warning, mine fields ahead! ", a sharp reminder of the recent war. Little did I realize that 40 years later my nephew Roei would still be clearing mines. But there was more: on going war and terrorism. The Lod massacre, Kozo Okamoto. I can feel it like yesterday. The shattering blow became part of my personal history, part of my childhood, part of who I am today. Our airport, the one where we picked up our relatives who came to Israel to visit us, the one where our friend Mr. Sanderson worked, our airport, so close to home, was hit. On the night of 30 May 1972, at around 10:30 p.m., three Japanese citizens stood with a group of passengers on an Air France flight which had just arrived at Lod Airport (now Ben-Gurion Airport) in Israel and was waiting for their luggage. No one guessed that they were members of the international terror group known as the Japanese Red Army and they had come to Israel on a mission for a Palestinian terror organization, the Popular Front for the Liberation of Palestine. When the three received their suitcases they suddenly took out submachine guns and hand grenades and began to shoot and throw grenades in all directions. When the firing stopped it was found that 24 people had been killed and over 70 wounded. Eight of the dead were Israelis and the rest foreign tourists. Two of the terrorists were killed, and the third, Kozo Okamoto, was wounded and captured. An internationally renowned Israeli scientist, Aharon Katzir, brother of future president Ephraim Katzir, was killed in the attack. But the attackers were not Arabs. They were three Japanese men dressed in business suits and carrying violin cases. Those cases contained automatic rifles and 26 people fell dead that day. About 80 were badly wounded. As I read this, decades after the fact, the pain returns and the past is now. That is our airport where my dad, of blessed memory, picked up my grandmother Mina of blessed memory, and my grandparents Rabbi Isaac and Henrietta Klein, and my relatives the Shapiro's and the Berkowitz's, cousins Steven and Herbert, my late Aunts Esther and Sylvia. That was our airport. So close to home. I can see my father's concerned face; We have been hit!! They got us! To live with terror, to live with war, to live on the edge, never to know what tomorrow will bring. 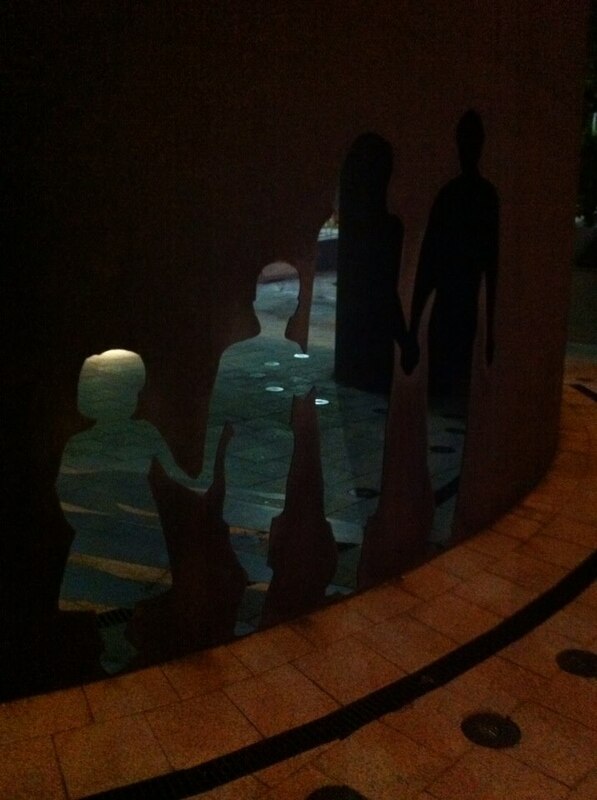 I can see my dear father's face. His blood runs in my veins, he is with me when I teach Krav Maga to the world. This is what makes our Krav different. Look to the source. Look where your Krav Maga comes from. For me it comes from my life, it comes from my heart. IKI Members of Tour and Train at Caliber 3. They are being trained by one of our legends; a man who participated in many daring rescue missions, a counter-terror legend, a man of peace. The years fade and I am at Caliber 3 school for Counter-Terrorism with our Tour and Train group. It has been ten years since my dad's passing but his spirit is always with me. My friends, Steve, Shai, Sharon and Eitan are armed to the teeth, with weapons and skills, and speaking to our group consisting of Krav Maga students from all over the world. I can feel the pain in their voices. But they have taken this pain, the pain of our people, and have used it to develop the best counter-terror program in the world, and now they are teaching the world. When they speak it is with the words, vision and passion of a Biblical prophet of old. "We stand guard and on my watch there will be NO terrorism. Many of our friends have paid the ultimate price but this only strengthens our resolve. If a terrorist wants to get by - he will have to get through me!" (As Steve points at his own body). At Tour and Train Israel Experience our students from all over the world come face to face with the face of an Israeli warrior. We grew up with this pain we have dedicated our entire lives to the defense of our people, our country and the right of all people all over the world to live in freedom. 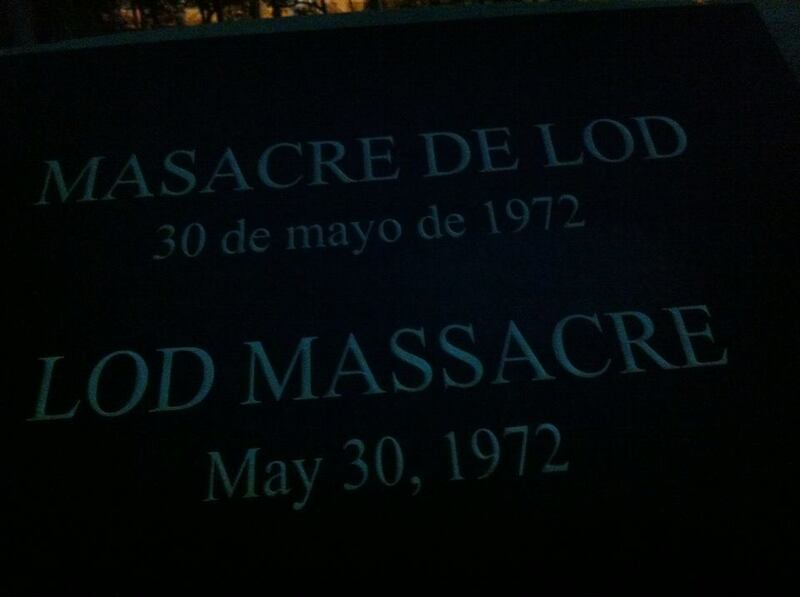 The Lod Massacre; of the 26 dead 17 are Puerto Ricans. Led by their Pastor, Reverend Angel Berganzo, these people came to our country to visit the places which mark the origins of their faith. They came as pilgrims and died as martyrs, they came from Puerto Rico (the port of Rico) and they died at the Port of the Holy Land. Yesterday I paid tribute to their memory. In San Juan I had the pivilege to visit a monument to their memory, (Thank you to David for the tour) my fingers touched the engraving of the names as the breaking news of the attack returned to my consciousness. As the monument pointed out it was a shared tragedy that forever bonded Israelis and Puerto Ricans. Next to the monument of the Lod Airport Massacre is another, beautifully dedicated to the more than 6 million Jewish victims of the Holocaust as well as countless other victims of Nazism. How beautiful that San Juan honors this memory. But our bond is even deeper. As I have come to learn there are countless Puerto Ricans of Jewish Sephardi descent. (Jews originally from the Spanish controlled areas). They originally came to Puerto Rico, as they came to many other Spanish speaking lands, to escape the Spanish Inquisition and the persecution of the Catholic Church. Our dear friend and student, Luis Muniz Arroyo, recently discovered that on both sides of his family he is descended from Sephardi Jews. His family were "hidden Jews" (Marranos - "pigs") who openly embraced Catholicism but privately maintained their Judaism. In time their Jewish heritage was lost. On the left, Luis Arroyo training in Krav Maga. But most Jewish Puerto Ricans have long since lost their Jewish heritage. Five hundred years of secrecy and "blending in" took its toll. Today they will never know or acknowledge their Jewish past. Tragic. The Inquisition succeeded: They have lost their Jewish heritage. I am certain that many of these 17 Puerto Rican martyrs who died so close to my childhood home had Jewish origins. Their blood called them home, a home that they were exiled from nearly 2,000 years earlier. They did not fulfill their dream of visiting the Holy Land but they died with us as martyrs and are forever linked to our land, perhaps their own ancestral homeland. Their blood soaked the Holy Land. They are now part of the Land forever. The blood of our brothers calls out to us from the ground. 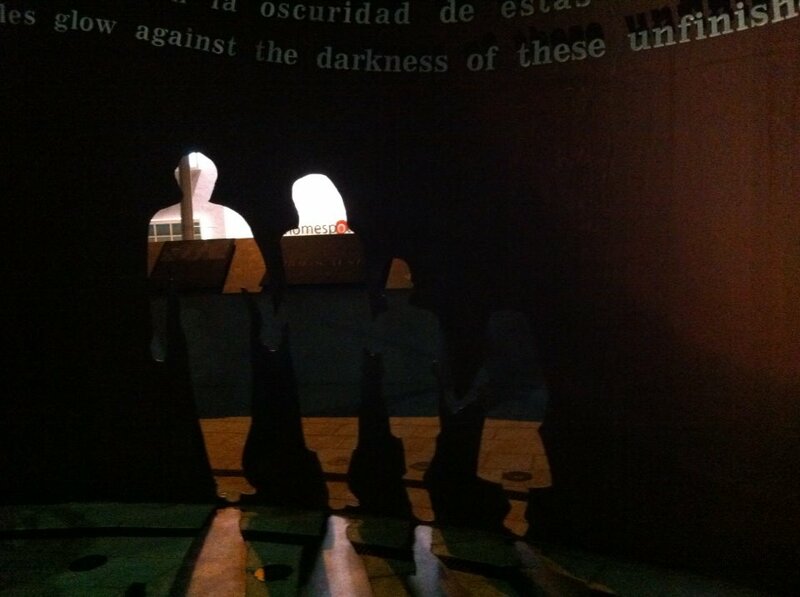 Shoah, Holocaust, Puerto Rico honors the memory of the victims of the Holocaust. To those who were taken away and never came back. The empty space remains empty forever. San Juan, Puerto Rico. 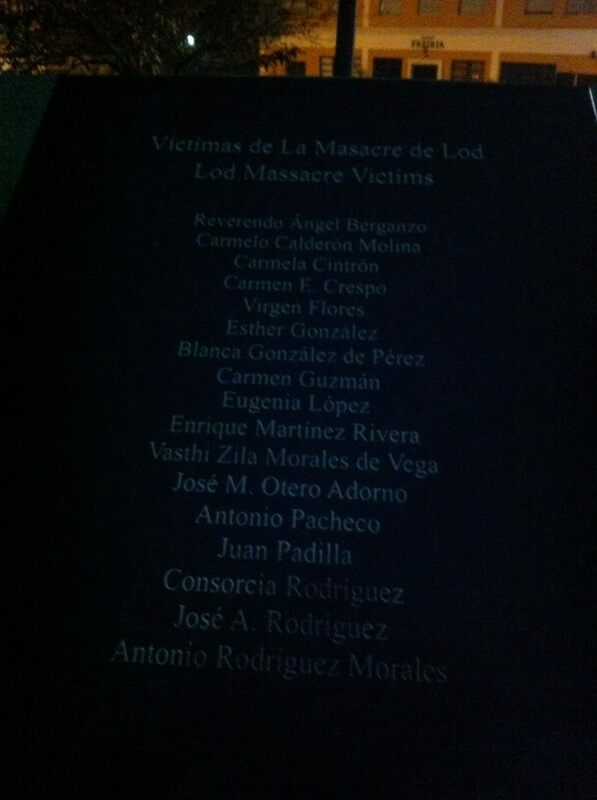 Honoring the memory of the victims of the Lod Massacre. The names of the Puerto Rican pilgrims to the Holy Land, and their leader, shall not be forgotten. 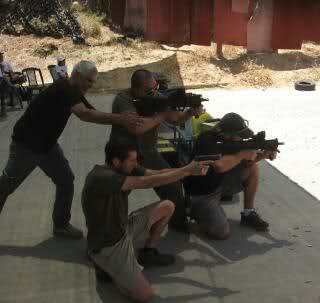 Join us in Israel for the ultimate Krav Maga experience. Not only will you be training in Krav Maga but you will be learning the history, the culture, the mindset.